Designs for Health® was founded in 1989 by team of dedicated nutritionists. The company was formed in response to clinician requests for nutritional approaches for specific treatment needs. To this day, Designs for Health® remains committed to providing high quality science-backed nutritional supplements, while continuing their collaboration with nutritionally-minded clinicians. In their quest to develop efficacious products that maximize the potential for successful health outcomes, Designs for Health® focuses on quality ingredients, manufacturing integrity, optimal therapeutic dosages and an unwavering commitment to unbiased cutting-edge scientific research and clinical support. By holding itself to extremely high standards, Designs for Health® provides quality professional brand nutritional supplements designed to enhance the diet by optimizing nutritional wellness and increasing metabolic efficiency. To maximize efficacy, their comprehensive approach and exceptionally high standards ensure consistently superior synergistic bioidentical supplements specifically formulated for certain conditions. All raw materials are tested for identity, potency, heavy metals, microbes and pesticide residue. Final testing of finished products ensures purity as well as label claim dependability. 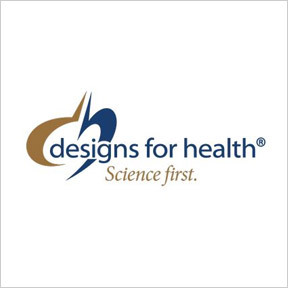 Designs for Health® top quality formulations are available solely though healthcare practitioners. OmegAvail™ Citrus Sorbet Smoothie: This high potency fish oil smoothie provides a tasty and convenient way to get a daily dose of essential omega-3 fats. A proprietary emulsification process significantly reduces the size of the fish oil molecules, resulting in enhanced absorption and utilization. OmegAvail™ fish oil is molecularly distilled and filtered ensuring potency and purity without fishy taste or oily texture. Suitable for children, adults and those who prefer an easy-to-take good tasting liquid formula. Gluten, heavy metal, pesticide and PCB free, Non-GMO, naturally flavored formulation. Other available flavors include Lemon Drop, Key Lime and Mango Peach. Keto-Nootropic™: This formula provides a powerful blend of exogenous ketones in a delicious easy-to-dose powdered drink mix. Formulated to support healthy cognitive function, sharp focus and mental acuity, Keto-Nootropic™ is a fast acting, readily available carbohydrate-free fuel source that may offer a boost to athletic performance and provide sustained energy during physical activity. Naturally flavored, stevia sweetened, gluten free, Non-GMO formulation. ProbioMed™ 50: Designed for maximum therapeutic potential, this high potency, shelf stable, dairy-free probiotic formula provides ten robust strains of microflora delivering 50 billion cfu per delayed-release capsule. Specific strains capable of surviving the harsh stomach environment colonize in the intestines to effectively support gastrointestinal health. No refrigeration is required making ProbioMed™ convenient for travel, home or office. Gluten free, Non-GMO formulation. Also available: ProbioMed™ 100. — The Professional Supplement Center is a great way to purchase supplements online. The website is efficient and easy to use, and telephone support is also available with experienced staff. I highly recommend this site to anyone looking for a high quality, low cost source for supplements. — I just wanted to say, that in this day and age of little or no customer service, your people are great. The woman who takes the orders on the phone is a delight and the orders always come quickly. I will be a continuing customer and will extol your virtues to others. Thanks again. — It has been a pleasure to do business with you. I appreciate the promptness and follow up with the emails and copy in the mail of my return and credit. — Awesome. So excited to have found you online. There was another distributor online but their site was not as secure as yours and I decided against ordering from them. Thank you again and have a good day! — Thank you so much for your prompt response and for applying the credit to my card. I appreciate your excellent customer service and I will most definitely use your company when I need to reorder. — Thank you! My orders always arrive in a timely manner, exactly as I had requested. I appreciate your efforts. — Thanks for being so speedy. You the most efficient and time conscious vendor that I have ever dealt with! — I just placed my first order with you, and I must say that I am very impressed with your responsiveness AND your professionalism. Thank you. — You are so very kind. Thank you, thank you. Next time I need some, it will definitely be from you. Over the years, I have ordered several times under my maiden name. You guys always had the BEST customer service.Thank you again!!! — Just wanted to say, my shipment arrived today and I am very pleased with your service. Just wanted to say thanks and looking forward to more orders. — I very much want to thank you for your fine customer service. I do appreciate your time and help. — Thank you so much for helping me out. I tell many people about your great store. — Got my order yesterday. Wow! What great service. Thank you! — You guys are just the best! Thanks so much for the speedy service, as usual!! — The order arrived in a timely fashion, with good prices as well. — Thank you for your prompt and clear information.